Contemporary energy needs require large-scale electrochemical energy conversion and storage systems. Batteries are playing a prominent role in portable electronics and electric vehicles. This course introduces principles and mathematical models of electrochemical energy conversion and storage. Students will study thermodynamics, reaction kinetics pertaining to electrochemical reactions, phase transformations relating to batteries. 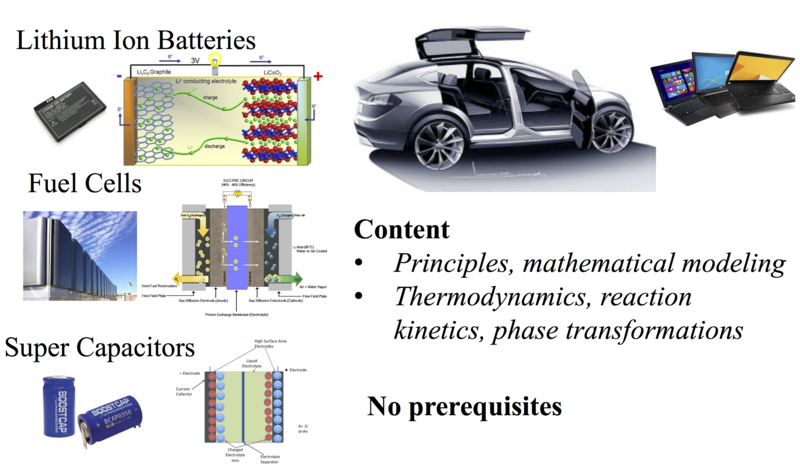 This course includes applications to batteries, fuel cells, supercapacitors. Electrochemical energy systems are at the forefront of possible storage technologies that could address the energy storage gap generated by renewable energy penetration and the need to reduce CO2 emissions. Robust electrode/electrolyte interfaces are a crucial requirement for the long term reliability of fuel cells and batteries. This course will teach the fundamentals in understanding and identifying the fundamental limitations of electrochemical systems.